This is the third and final part in our three-part series on Towing Vehicles and weights. Having looked closely at the most common types of dual-cab utes on the market, in this article, Keith delves into 4WD wagons and their capacity as towing vehicles. After previously looking at Utes in my last article, one must ask, as for the Four Wheel Drive Wagons they do fare better? With the Landcruiser 200, Landcruiser 70 Troop Carrier, Jeep Grand Cherokee, Nissan Patrol and Land Rover Discovery TD6 all able to pull the full 3500Kg when fully loaded. Several other Wagons which are only rated for 3000Kg towing can also meet their full weight requirement, these are the Isuzu MU-X, Discovery TD4, Pajero Exceed, and the new Prado GXL or Kakadu. The major difference here, as referenced above, is that most wagons have a smaller payload, many below 300Kg after towball weight. This obviously requires a bit more care in packing and loading. The chart below provides all the base figures for the common models. As you refer to the chart, here are some figures to help in Calculating Your Load: The best approach is of course to weigh everything but we provide a guide here to what many commonly added items may weigh. Dual Drawers with fridge slide – Adds 100Kg, less any removed seats in a wagon. The bottom line of all these comparisons is that you can get more overall load capacity from some Utes because of their lower Kerb weight and larger carrying capacity but you have to choose the right Ute (and model) to achieve this. 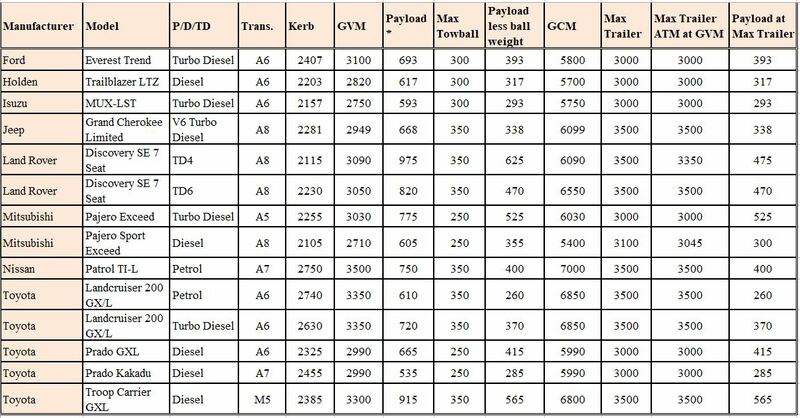 Refer to previous posts on Weight Definitions (Part 1) and Towing Utes (Part 2) for interpretation of these figures and further guidance. Disclaimer: This article is written from the point of view of the author who does not claim to be an expert on this topic. It is merely meant as a guide and any information provided should be thoroughly researched by the reader. Any information contained in this article which may imply a legal requirement is sourced from freely available published documentation from various relevant authorities. FRC do not have a preference for any vehicle make or model referred to in this article, nor have they been paid to recommend any particular makes or models.